There are many reasons why your hair may be thinning. Thyroid problems and other hormonal imbalances can be the cause. Stress resulting from traumatic events like a divorce or health conditions like a pregnancy or a major surgery can result in severe hair loss. According to dermatologists, severe hair loss is one of the top symptoms in diagnosing anorexics. When the human body is starved of food, rather than making or maintaining its hair, it directs whatever little energy it has into the functioning of its most essential organs like the heart and the brain. Since hair is primarily made of protein, a diet rich in lean protein like lentils, beans, fish, and chicken can help save your strands. About 25 to 30% of your total calories should be from the lean protein. Many of us comb our hair after a wash to detangle and smoothen out the tresses. But this often leads to breakage as wet hair is more fragile. It’s best to let the hair dry before brushing it and even then, don’t brush it 100 times a day as advised by the older generations. Tugging at the hair so much will result in plenty of breakage. If you do need to comb your wet hair, use a comb, not a brush and be as gentle as possible. Tight hairstyles involving pulling your hair back into tight buns or a ponytail can damage your hair as these styles put excessive tension on the hair follicles. Constantly sporting such hairstyles can lead to alopecia, a medical condition where the hair follicles are permanently weakened and cannot grow . Wear your hair down whenever possible. When you do tie your hair, ensure it is not pulling on your scalp. Change your hairstyle occasionally and use fabric made bands for tying them. Never use rubber bands to tie your hair as they can cause breakage. The high heat from blow dryers and other hair styling equipment can lead to hair damage. Never use curling irons or straighteners on wet hair. The excessive heat on fragile wet hair leads to hair breakage and makes the scalp more prone to hair fall. It is best to limit the use of this equipment and allow your hair to air-dry as much as possible. The wrong oral birth control can damage the hair of women who are sensitive to hair loss due to hormonal changes during menstruation. If you are an androgen-sensitive  person, birth control pills containing androgens can cause your hair to fall out. In such cases, you can switch to low-androgen index birth control pills. If you are doubtful, you can test for androgen sensitivity, all it takes is a quick cheek swab genetic test. 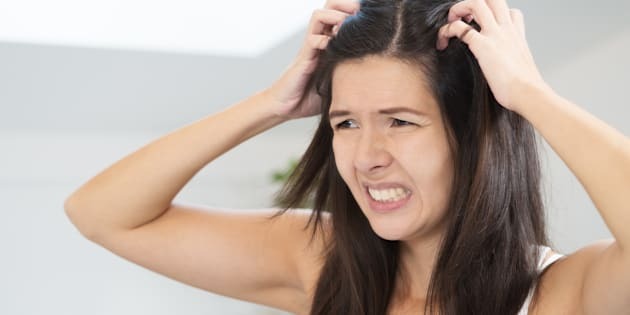 If you suffer from dandruff, a lice infestation or an itchy scalp due to any other reason, the constant scratching to relieve the itch can cause cuticle damage which makes the hair fiber more prone to breakage. It’s better to relieve the itch with over-the-counter products like shampoos with zinc pyrithione, tea tree oil or selenium. Visit a dermatologist if the problem does not resolve, they may prescribe antifungal shampoo or cortisone foam to help with the itching.